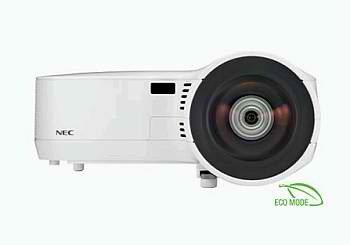 Full-featured yet affordable, the NP610S portable projector delivers an ideal short throw distance solution for education, corporate and small-to-medium-sized business applications. Bright enough for use in large rooms, this model can be connected to the network for remote monitoring and control. Standout features include a short throw distance, closed captioning for hearing impaired, quick start/shutdown, automatic vertical keystone correction, monitor out, virtual remote control and built-in wall color correction.